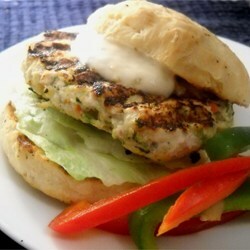 These are homemade chicken burgers with an awesome tartar sauce! It’s simple, fast, and quite tasty. Prepare tartar sauce by stirring together mayonnaise, relish, hot sauce, garlic, and lime juice in a small bowl. Cover and refrigerate at least 20 minutes. Prepare chicken burgers by mixing together green pepper, red pepper, cilantro, onion, garlic, hot sauce, salt, and pepper in a large bowl. Mix in chicken using your hands until well blended, then sprinkle on bread crumbs, and continue mixing until incorporated. Divide the meat into 8 portions, and flatten to make patties. Cook patties on preheated grill until no longer pink in the center, about 5 minutes per side. Assemble burgers by spreading the cut sides of the hamburger buns with tartar sauce, adding a chicken patty, and topping with a piece of lettuce. Voila! You have a tasty Chicken Tartar Burger.